We know it's a bit early to be thinking about holiday gifts or decorations but if you follow these simple instructions NOW, you will have some really lovely items to work with. It's very easy today and only requires a bit of early planning. 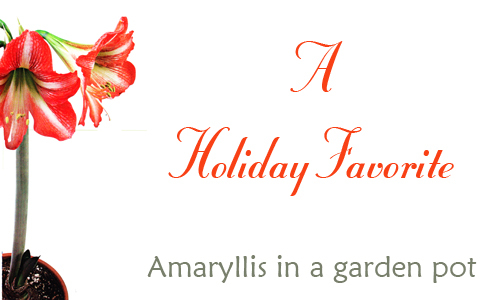 A cheerful amaryllis makes a wonderful holiday gift and you will want to plant some for yourself to enjoy and decorate with. Below are the easy steps to follow so that you have great success. 1. Choose the container: Measure the bulb or bulbs you are planning to pot and make sure that the size of planter is big enough. You should go at least 2" larger in diameter than the size of the bulb and 2 inches deeper than the bulb with the roots. You can plant in a glazed colorful container, a poly resin durable pot or the wildly used terracotta pot and saucer as shown. Just make sure whatever you pick that it has a drain hole. 2. Add an inch or so of potting soil in the bottom of the pot. Place the bulb in the container and add the mix around it being careful not to damage the roots. Leave the top third of the bulb exposed. 3. Moisten the soil and press it down gently to eliminate air pockets and make sure the bulb is sitting correctly and not leaning to one side or the other. Put the amaryllis in a warm spot with indirect light. Water lightly until the flower bud and leaves emerge. Once this happens, move the potted bulb to a cooler area and water regularly. Keep the soil moist but not soggy. Keep the potted bulb away from bright light to extend the flowering. Read more.....Potting Kale in containers.